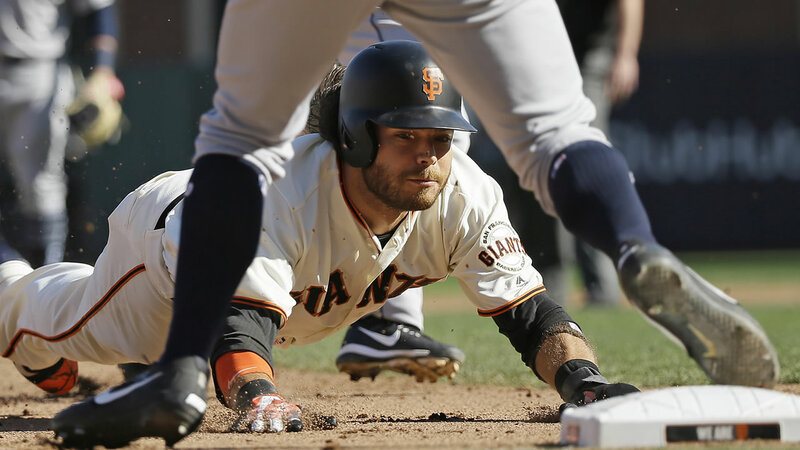 San Francisco Giants' Brandon Crawford is out stealing third base in the eighth inning of a baseball game against the San Diego Padres Saturday, Sept. 30, 2017, in San Francisco. SAN FRANCISCO (KGO) -- The San Francisco Giants will play their last game of the season on Sunday. One day after Matt Cain pitched his final game for the San Francisco Giants. Cain's exit means right-hander Johnny Cueto will take his place against the San Diego Padres on Sunday. The Padres ruined Cain's retirement party Saturday, scoring twice in the ninth inning for a 3-2 victory that squared the final regular-season series at a game apiece. A win Sunday with right-hander Luis Perdomo (8-11, 4.65 ERA) on the mound would give the Padres a clean sweep of the six series against the Giants this season. The San Francisco Giants will play their last game of the season against the San Diego Padres on Sunday.